Saltimbocca: The original recipe with video instructions in under 30 min. Cut veal cutlets into portions. Prepare a sheet of plastic wrap on a working surface, distribute veal cutlets, and cover with plastic wrap. Flatten the cutlets using a meat tenderizer. Transfer to a plate and repeat with remaining veal cutlets. Season veal cutlets with salt. Place one slice of Prosciutto di Parma and one sage leaf on each veal cutlet and fix in place using a toothpick. Heat olive oil in a frying pan. Add veal cutlets and sear for approx. 1 – 2 min. on each side, then add butter to the frying pan. Once the butter has melted, remove cutlets from frying pan and stir together the butter and pan drippings until combined. Deglaze with white wine and stir again. Remove toothpicks, transfer saltimbocca back to the pan and reheat in the sauce. 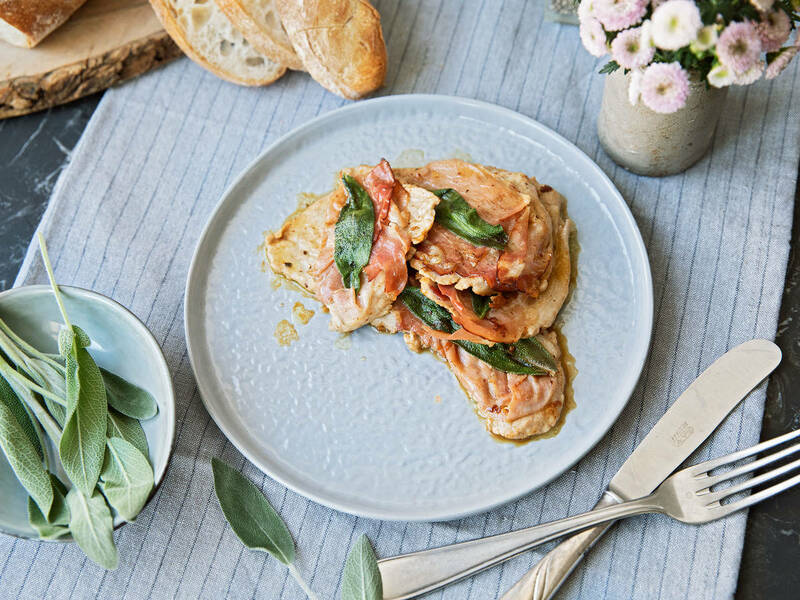 Serve saltimbocca with a drizzle with sauce. Enjoy!